“Argentina” derives from the Latin word “Argentum” which means silver. The Pampa Indians already adorned their wives with silver bracelets way before the Spanish conquered America, who incorporated this ornamental precious metal into the construction of their churches and altars. 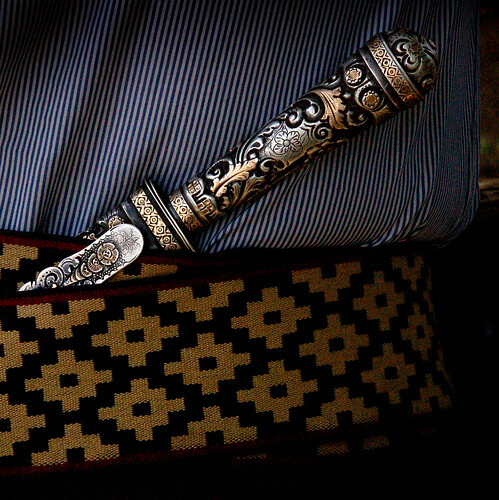 With the colonization, the use of silver spread and was introduced into every day objects such as mates, silverware, gaucho knives and horse accessories becoming a definitive part of the national identity. Now a days many talented local silversmiths carry on with this traditional craftsmanship.San Antonio de Areco, a town on the outskirts of Buenos Aires, has an important silverware production and a museum. In Buenos Aires some of the most renowned silversmiths are Marcelo Toledo , and Juan Carlos Pallarols , both in San Telmo.